To further facilitate viewing images taken and shown on your walls through our software, please take a few pictures with you smartphone camera and send them to us. We can then load them and the photo shoot images (we took of you) into our special software and show you how the images would look framed and sized on your actual walls before you buy! 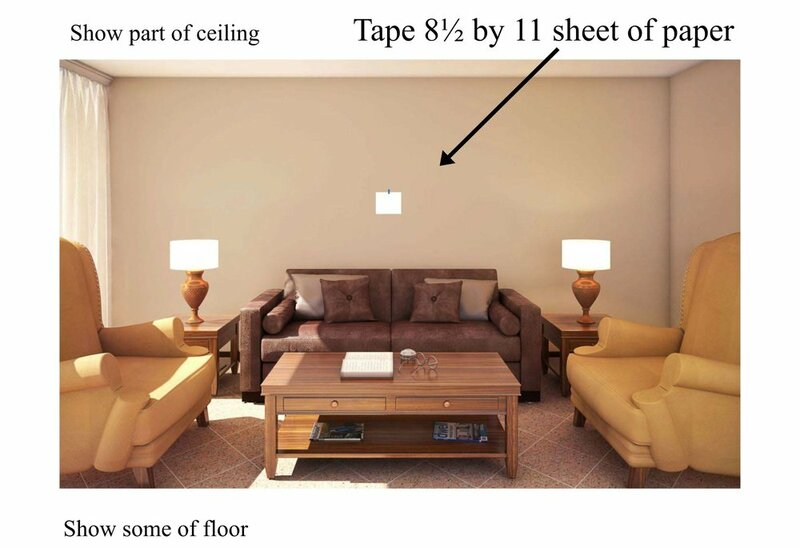 Please tape an 8 and 1/2 by 11 inch sheet of paper on the wall for reference. For best results use low tack tape such as blue painters tape. Hold smartphone camera level with the wall for the best picture. Here is one example of how the image will distort if you tilt your camera down and take a picture. Tilting your smartphone camera will make the top part of the wall bigger than the bottom. Here is another example of how the image will distort if you tilt your smartphone camera up when taking the picture. Tilting the smartphone camera up will make the bottom part of the wall bigger than the top. Click here to see a video on how to take pictures of your wall. Currently the program is in Beta Testing so disregard all but how to do the photography. You can text the pictures to me directly at 513-445-9535.